BEP 882 is a Bedford OB from the Mid-Wales Motorways fleet. She is seen at Dunsfold, on one of the occasions the "Wisley" rally wasn’t held at Wisley, on 10 April, 2011. She has a Duple B29F body and dates from 1951. Mid-Wales Motorways was a medium sized independent operator working in the Welsh Marches. Based at Newtown, the fleet operated some lengthy routes, some of which crossed the border into England. Here we see RCT 2, a Bedford SB3 with Yeates bodywork, which was new to Delaine, Bourne, but spent most of it’s life with Mid Wales. A similar vehicle from the fleet of Worthern Motors is seen in the background, and between them is another Mid Wales Bedford, a VAS5/Duple Vista 25 which is slightly too modern for this site! My book on North Wales independents was originally supposed to include Montgomeryshire, but I seriously over-ran on the page count and so had to leave it for another day. However, I’d already collected a lot of pictures from the area, many of them taken in Montgomery itself. One thing I noticed is that the chimneys in the photographs were always smoking away merrily regardless of the levels of sunlight! Is Montgomery known for being a particularly cold place as well as an undeniably scenic one? The Worthen Motorways SB/Yeates in the background appears "full frame" in my book on Shropshire independents, but I’ve never been sure whose colour scheme it wears. Worthen didn’t really have one at this point in its existence – the vehicles inherited from MWM at the beginning merely had their cream areas overpainted in red. When the gentleman who took the photo says it was 1960 I have to believe him but what is that green car to the left of the picture. At first I thought Humber Sceptre but the Arrow version didn’t appear until 1967, then I thought HB Viva but they too didn’t fall off the Vauxhall lines until about 67/8 so it can’t be one of them? Yes it did, thanks. It’s a ‘mark 2’ (i.e. Rootes Arrow design) Humber Sceptre so the picture dates from 1967 or later. I think "1960" relates to the year of the vehicle, not when it was photographed, Orla. Certainly, RCT3, the preserved Delaine Titan, is listed as a 1960 vehicle. (No Delaine vehicles in the list on the left – I’ll have to dig out some of mine, unless one or other among the readership gets in first!) It looks to me as if the offending car’s registration plate is black on yellow, so the view must have been captured in or after 1967. It’s definitely a Humber Sceptre, with its silver plate at the back and vinyl roof. My next-door neighbour had one, even in this colour! Mmm, stylish! Yet another misinterpretation of a photo heading, the second within 2 days. Orla, I fear the 1960 refers to the build date of the Bedford, not the date of the photo. Perhaps Peter might wish to consider altering the layout of the heading for future photos? It appears to be a "yellow" rear number plate. As far as I know this type of plate wasn’t issued on new cars until 1968 / 1969. I have to concur with Orla, the Mk II Sceptre (which this is) with 1725cc engine, first appeared in 1965.I had this exact colour MkII Sceptre as a Company car in 1971/2. Further identification is the ‘Scepre’ motif on the lower near-side vynl roof. The historical Delaine fleet list may be found here:- www.delainebuses.co.uk/Fleet/Fleet%20List%201919-2014.pdf This vehicle is listed as fleet no.49, registration No. RCT 2, a Bedford SB3, chassis no.78234 with Yeates Europa C41F body, new 05/1960, sold 06/1966 to Price of Wrockwardine Wood, Telford. Insofar as Peter’s headings are concerned, in response to Eric’s suggestion, I have always taken the date quoted to be that of the depicted vehicle when new, not the date of the photograph. This is surely fundamental to the substance of each picture submitted, and I, personally, would not wish that to change. The photograph date can always be stated in the accompanying text if this is deemed vital. The coach would be from around 1960. 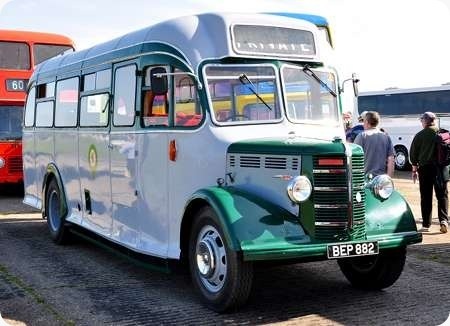 I drove for A L Moore of Sleaford whose premises were only around 20 miles from Delaine and we had a very similar coach registered MCT 440 which dated from 1957. Both were registered in Sleaford, Lincs. We also had a later style Europa, PTL 850 which was new in 1961. Both were SB3 petrol engine and very smooth, superb vehicles to drive. Yeates were different, but I preferred them to mainstream body styles (except early Panoramas, perhaps). I am surprised at the direction this discussion has taken. I did not specify when the photo was taken, but it was actually around 1969 or 1970. Don may well be surprised at the direction this discussion has taken, but for an OBP discussion to go off at a tangent is completely normal! I’m taking a bit of a risk here, trying to tell someone when they took their photo, but here goes. Don himself reckons that the Bedford VAS visible in the shot is too modern for this site, so that implies a 1970+ vehicle, with photograph date to match. The said vehicle actually looks to be one of MEP889/90K, new to Mid-Wales in 7/72 – so there’s an earliest date for the shot. Roger, can I clarify my suggestion about photo headings. I agree entirely with you about the build date of the subject vehicle being fundamental, and like yourself I have always taken the date to refer to when the vehicle was new, but we have the situation where comments have been generated within a couple of days of one another on two photos because the commentators have misinterpreted the build date as the photo date. My suggestion was merely to re-arrange the layout of the photo heading so it becomes less likely that the date is taken in the wrong text. Can I also make a correction to Nigel’s comment about the Humber Sceptre in the photo. It is actually a Mk. III model produced between 1967 and 1976. The Mk II was an upgrade of the Mk I and was produced between 1965-7. …..but like many cars of that era, the Sceptre was a downgrade of the traditional cars of that marque which came before it! 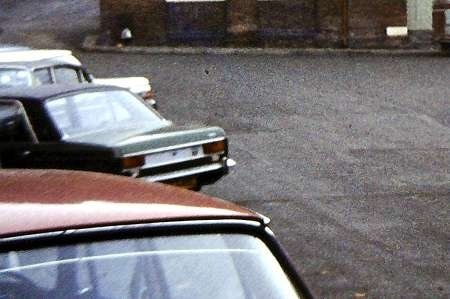 The other cars are a Series V Humber Super Snipe upper side veiw and the rear window of a Rover P6. Off-topic: this was a version, I think of the Hillman Hunter, produced at the same time as the Super Minx family as a more lightweight alternative to that rather underpowered but much liked tank. On-topic: As with buses, when you start to cut down on the weight, other things go as well. Off-topic Eventually the Hunter was badge engineered: the Sunbeam Rapier for example was a giant coupe of rather bizarre appearance. On-topic: were petrol engines at all in demand for coaches, post Suez? Puthering – that’s what the chimneys are doing, Neville. I think its an East Midlands dialect word for when chimneys are throwing-out smoke before the fire gets going. Well, I know what it means – I’m just not that certain its an East Midlands word. And – sorry to drift off thread here – David R (10/6) mentions the yellow rear number plate. Are the old white/silver-on-black plates now illegal for new vehicles – LT continued with them into the TH/B15 era, well after everybody else had moved over (did they get special dispensation?). The petrol Bedford SB3 was very popular until about 1962. 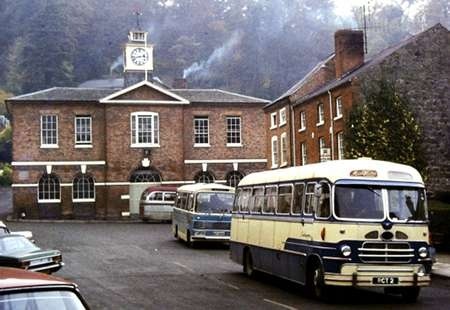 From then on, the diesel gradually took over and was universal by 1967. Salopia continued against the trend to buy SB3s but were also alone in buying the VAM3 where everyone else bought the VAM5 with Bedford 330 diesel or VAM14 with Leyland O.400. As far as I know, Bedford were the last manufacturer to offer petrol. Ford had offered petrol but had more or less standardised on diesel long before Bedford. Old-style plates can only legally be carried by vehicles registered before 1st January 1973. Love the word ‘puthering’, wherever it came from. OK, so it should be apparent by now that I spent more time in the ’60’s looking at cars rather than coaches (in fact I never did, being much more a Corporation bus follower). I loosely termed the Humber Sceptre a ‘mark 2’ because the I wasn’t sure if the 1965 facelift and the then introduction of the 1725cc 5 bearing crankshaft engine represented a formal change of mark on the Sceptre (though it did on the contemporary Hillman Minx and perhaps the Super Minx on which the Sceptre was based, all having previously had a 3 bearing crankshaft in their 1600cc (approx) engines). The Hillman Hunter replaced the Super Minx in 1966. The Singer Vogue took the new Arrow design at the same time whilst the Sceptre based on the Hunter shell was introduced early in 1967 along with a Minx and Singer Gazelle bearing a 1500cc (approx) engine. The fastback Rapier followed shortly after this. Yes it illegal to have black and white plates on a new car. Until recently it was only permitted on vehicles regd before 1 Jan 73 but that may have moved on a year now with the change in tax exempt deadline. I too don’t know how LT managed to keep black and white plates on new vehicles well in the ’70’s. Back to the coaches, for what it’s worth, if there is a date in a picture heading heading I prefer it to apply to the date it portrays rather than than of the vehicle(s). Almost all Ripponden & District wagons carried silver on black number plates until the company ceased trading – only a few years ago. I seem to recall once reading somewhere that the requirement for reflective plates did not apply to certain heavy vehicle classes, but that it was not a well published fact and that most operators who were not in the know just assumed they had to fit them. However, try as I might,I can’t find any reference to this anywhere now. Surely the mighty LT wouldn’t do anything illegal would they? The legislation regarding compulsory reflective plates after 1st January 1973 only applied to cars and not buses/lorries. That’s how LT got round it. Parcel carrier (and form PSV operator) Ripponden and District continued to use black & white plates on their lorries for years after the 1st Jan regs. came in. I’ll stick my neck out here and go so far as to say black & white plates on lorries and buses was still legal till the change to the current format (51) in 2001, though I stand to be corrected on that point. It is my recollection that, initially at least, the requirement to display reflective number plates did not apply to heavier vehicles – perhaps the logic was that they were big enough for people to see them anyway! After trawling the net for a while I have managed to unearth the following, which appeared in ‘Commercial Motor’ dated 13 December 1980. ‘Reflective number plates must be fitted to vehicles first registered on or after January 1, 1973, except vehicles over three tons unladen, which are fitted with reflective rear markings, stage carriages, pedestrian controlled vehicles, work trucks, agricultural machines and trailers’. I haven’t been able to find any reference to any changes in the legislation since 1980. I absolutely cannot agree with Orla re the nature of the date in the picture heading. Surely it is the vehicle itself that we are primarily discussing in each OBP entry, however interesting the surroundings or background story. The picture date and other details can always be stated in the accompanying text if required. The adoption of the photo date in each title rather than the vehicle construction date is going to lead to some significant misunderstandings and inconsistencies. In any case, what date would one show if the picture date were unknown? I see pictures like this as a tableau of days gone within which setting the passenger vehicle(s) hold the most interest but form only a part of the historical record. It is as such that I give pre-eminence to the importance of the date of the picture and then within that the age of the buildings, the vehicles, the fashions etc. I’m not hung up on it and of course there are times when no date is known and there is pleasure into trying to establish that point in history by reference to the content. To posters concerned, thanks for the clarification re. number-plates. And thanks, Orla, for sorting-out some Rootes Group badge engineering which has troubled me for some time – I assume that in due course the Arrow Hillman Minx became a 1500cc Hunter. And (sorry to drift off again): does anybody know why yellow was chosen as the colour for the rear plate? red would have seemed to be more logical – unless, I suppose, if the letters had to be black, they wouldn’t show up well on red in day-time . . . Many thanks Don for this wonderful image, I still visit Mongomery on a regular basis and as mentioned this view has not changed it is well worth a visit, RCT 2 can be seen outside the Chequers public house (sadly now converted into a French themed overpriced restaurant) at the side of the town hall in the rear of the photo is Bonner and son a time warp hardware store where "four candles" can be purchased, at the top of the square can be found Castle street garage D R Pugh and Son a typical rural garage, Ron Pugh (the proprietor) my cousin was a well known local character who drove part time for Mid Wales Motorways he was also a volunteer fireman in the village I remember him whizzing past in one of Mid wales many Bedford OBs sounding the horn on an afternoon school run, he also drove a Morris J type van based mini bus I am unable to locate a photo of this vehicle, and of all the vehicles mentioned in the comments, these and more could be found behind the garage and in a field further down the road, a huge array of stored cars some of which ended up restored this image brings back many happy visits to Montgomery and of course watching Mid Wales vehicles at work. Philip, black letters on red plates were tried in Ireland in, if I remember correctly, the late 1970s. A very few survive on preserved vehicles but, considering there are still plenty of original style plates around on older vehicles and agricultural machinery, the experiment was not a success and was eventually terminated when the British style system was abandoned in favour of the year and county mark system. Wow, reading the above comments reminds me of Home. Ron Pugh as mentioned above also drove for my father who was Montgomerys own coach operator, County Garage later Trefaldwyn Motors. Does anyone have any photos of our motors?? Many thanks for mentioning Ron Pugh, indeed he did drive for your fathers company and I should have mentioned Trefaldwyh Motors, a much respected company in Mongomery, of course Trefaldwyn being the welsh language for Montgomery, a really interesting book to read is Montgomery’e Buses an empire of independents by Brian Poole (Oakwood press) Trefaldwynn does get a mention along with two photos. I too would welcome more views of Trefaldwyn vehicles, sadly Ron Pugh passed away just over 3 years ago following a battle with cancer. However Joan Pugh now lives in Newtown.